New Theatre present WOLF LULLABY by Hilary Bell at the New Theatre, Newtown. 19th August - 13th September. WOLF LULLABY was written by Australian writer, Hilary Bell in 1996. 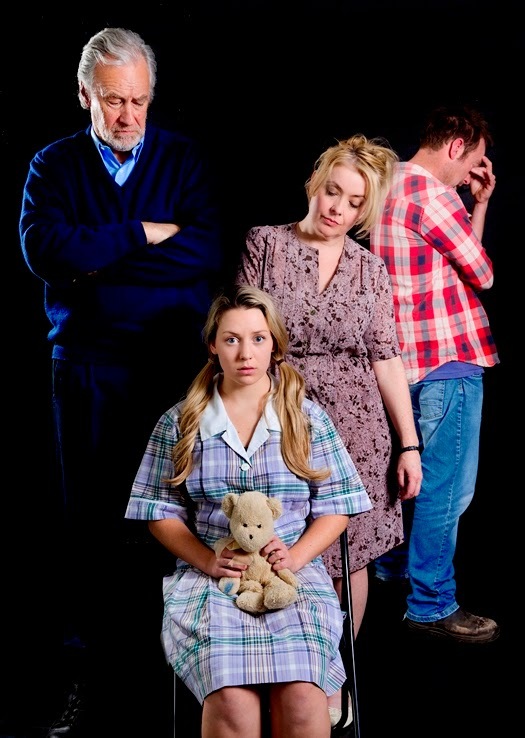 The play deals with the unheard cries of a little child, Lizzie Gael, living in the country regions of Tasmania. A neglected child, from a broken relationship, 'act-outs' her emotional unsettledness, with some behavioural transgressions, misread or ignored, by the authorities, which, ultimately, culminates in the murder of a young child. Ms Bell, charts in a collection of scenes these events, and the consequences, aftermath, for the survivors of such a 'terrible' deed in a straight forward, chronological narrative manner, with the magical world of a wolf, that haunts the little girl, Lizzie, in her alternate, imaginative world, included. There is some small discussion around Nature versus Nurture, recalling, for me, faint memories of the character of Rhoda, and her mother, from the 1954 novel, THE BAD SEED by William March (dramatised, by Maxwell Anderson - 1954; and adapted for screen, directed by Mervyn LeRoy - 1958). Is there such a thing as evil; an "evil child"? In her later work, Ms Bell reveals a fascination that sits real life stories alongside the liminal world of children's folk tales and stories, and the shadows of some of the creatures of those worlds that occupy them. WOLF LULLABY, an early work, introduces that creative obsession, which is to follow in her later work, e.g. THE SPLINTER. WOLF LULLABY feels, in 2014, oversimplified and outdated, and under researched - regarding the motivations and consequences of all involved: for instance, the police interview and investigations appear, uncomfortably, improper in practice; and the psychological 'sanctuaries', opportunities, for the family, and each of the individuals, on offer in our contemporary world has certainly moved forward, since 1996. Gitta Sereny in her book, CRIES UNHEARD, published in 1998, concerning the case of Mary Bell, who, in 1968, with another young girl, murdered two young boys in Newcastle upon Tyne, in the UK, offers a much more sophisticated examination of the evolving circumstances/world of the 'child killer', than Ms Bell attempts here. (This was Ms Sereny's second book concerning that case. The first: IN THE CASE OF MARY BELL was published in 1972.) And, although, different in structure, the Dennis Kelly play DNA (2007), dealing with children who kill, was a much more satisfactory investigation/dramatisation. In the contemporary limitations of the writing, Emma Louse, as a first-time Director, has created a competent production. It did hold us in a respectful attention - but, then, the disturbing subject matter demands, at least, that. All of the design elements, the Set Design, by Alan Walpole; Lighting by Heidi Brosnan; the joint Sound Design by Chelsea Reed and Alexander Tweedale, while functional appear just a trifle 'over weighted'. The performances from Maryellen George (Lizzie Gael), Lucy Miller (Angela Gael), David Woodland (Warren Gael), and Peter McAllum (Sergeant Ray Armstrong) are solid, if not complexly motivated or played. Gitta Sereny, 1998, Cries Unheard - Why Children Kill: The Story of Mary Bell, Metropolitan Books, Henry Holt and Company, New York.